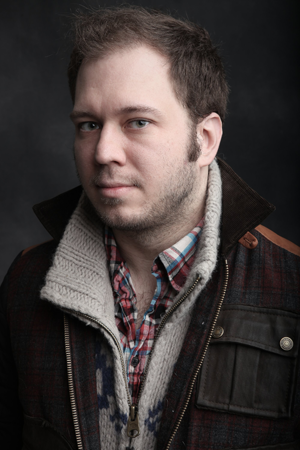 Royce Vavrek is an Alberta-born, Brooklyn-based librettist and lyricist known as “an exemplary creator of operatic prose” (The New York Times) and “a favorite collaborator of the postclassical set” (Time Out New York). His writing has been called “sharp, crisp, witty” (See Magazine), “meticulous” (Operavore, WQXR Radio), “full-throated” (CulturePOP), “taut” (The New Yorker), “dramatically wild” and “exhilarating” (The New York Times). His collaboration with composer David T. Little has led Heidi Waleson of the Wall Street Journal to proclaim them “one of the most exciting composer-librettist teams working in opera today.” Their first full-length opera, “Dog Days,” received its world premiere in September of 2012 at Peak Performances @ Montclair, in a production co-produced by Beth Morrison Projects and directed by legendary American maverick Robert Woodruff. The work was celebrated as the Classical Music Event of the year by Time Out New York, one of the year’s best by the New Jersey Star Ledger and a standout opera of recent decades by The New York Times. The production will travel to Fort Worth Opera and LA Opera in 2015 with the original creative team. Royce and David’s other collaborations include “Am I Born” for the Brooklyn Philharmonic and Brooklyn Youth Chorus, “Vinkensport, or The Finch Opera” for Bard Conservatory; “archaeology,” commissioned and recorded for The Opera America Songbook; and “Last Nightfall,” premiered as part of the 21c Liederabend, Op. 2 at The Kitchen. They are currently working on JFK, a grand opera commissioned by Fort Worth Opera and American Lyric Theater about John F. Kennedy’s final night. Royce will next premiere “27,” his first collaboration with composer Ricky Ian Gordon at the Opera Theatre of Saint Louis in June of 2014. Created for renowned mezzo-soprano Stephanie Blythe, the work explores Gertrude Stein’s famous salon at 27 rue de Fleurus that hosted the likes of Pablo Picasso, Henri Matisse, Ernest Hemingway and F. Scott Fitzgerald. The production will be directed by James Robinson, conducted by Michael Christie, and will feature soprano Elizabeth Futral in the role of Alice B. Toklas. With composer Missy Mazzoli he wrote the opera “Song from the Uproar” which was presented by Beth Morrison Projects at The Kitchen in February of 2012. An original cast recording of the opera was released in the fall of 2012 on New Amsterdam Records. They are currently adapting Lars von Trier’s Cannes Grand Prix award-winning film “Breaking the Waves” for Opera Philadelphia. The first aria from the opera was presented as part of the 21c Liederabend, Op. 3 at the Brooklyn Academy of Music last year. In the summer of 2013 Royce premiered the “The Hubble Cantata” with composer Paola Prestini at Bay Chamber Concerts, a collaboration with filmmaker Carmen Kordas and astrophysicist Mario Livio. The work was performed by soprano Jessica Rivera and the International Contemporary Ensemble and featured violinist Cornelius Dufallo. Royce and Paola are currently writing a second installment of “The Hubble Cantata” for baritone Nathan Gunn, as well as a collection of songs inspired by the posts of Cuban blogger Yoani Sanchez. One of their “Yoani” songs will be featured as part of the AIDS Quilt Songbook, performed by mezzo-soprano Isabel Leonard. Other recent and upcoming projects include “Strip Mall” with Matt Marks for the Los Angeles Philharmonic, “Stoned Prince” with Hannah Lash for loadbang, “Midwestern Gothic” with Josh Schmidt for Signature Theater and development of “The Wild Beast of the Bungalow” with Rachel Peters through the Center for Contemporary Opera. Royce is co-Artistic Director of The Coterie, an opera-theater company founded with soprano Lauren Worsham. He holds a BFA in Filmmaking and Creative Writing from Concordia University’s Mel Hoppenheim School of Cinema in Montreal and an MFA in Musical Theater Writing from New York University. He is an alum of ALT’s Composer Librettist Development Program.